Built for demanding environments that require robust enterprise software compatibility, the Motion® F5m Rugged Tablet Platform offers the durability and functionality you need to seamlessly go from the office, to the vehicle, to the field – all while staying connected and secure. 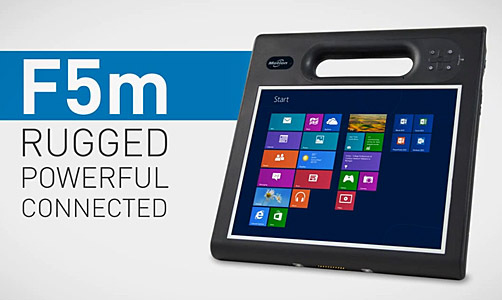 The new F5m rugged Windows®-based tablet makes field workers more productive by increasing efficiency, helping to reduce data capture errors and improving real-time communication capability resulting in better decision making and labor cost savings. Motion® has also given the F5m series a significant upgrade that delivers high-end, lasting processing power. The addition of the 5th Gen Intel® Core™ processors, including the highest performing Intel® i7 vPro™ processor, provides the power to quickly move through computation-intensive applications, while increasing overall power efficiency. Stay connected and productive with ultra-fast 4G XLTE mobile broadband connectivity, advanced u-blox GPS and 802.11ac technology that makes sharing large files and images easy. With over eight hours of battery life and a hot-swap battery feature, the F5m supports your longest work days. Add Motion’s View Anywhere® technology for outdoor visibility (optional) and Gorilla® Glass (standard) for durability to the capacitive dual-touch capability, and users get the benefit of an industry-leading display optimized for mobile environments. Gorilla® Glass offers up to four times the strength in breakage resistance(2), perfect for real-world mobile work environments. 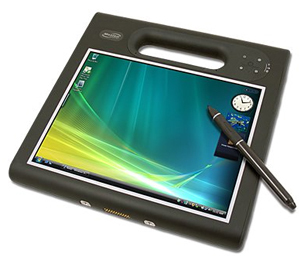 With 180-degree viewing angles of the Hydis AFFS+ LED backlit display and View Anywhere® technology for reduced reﬂectance and glare, you get the best tablet PC viewing experience available for outdoor use.